A third fight between Saul ‘Canelo’ Alvarez 50-1-2 (34) and arch-nemesis Gennady ‘Triple G’ Golovkin 38-1-1 (34) would appear to be a mere formality if the former undisputed middleweight champion signs with sports streaming service DAZN as expected. It is a fight that Alvarez said he is open to. During a conference call this week to promote his December 15 stay-busy bout against Rocky Fielding at New York’s Madison Square Garden the popular 28-year-old Mexican indicated his willingness to set up the trilogy despite already holding the edge in their two previous fights with a win and a draw. “He can do whatever he wants, whatever is convenient,” said Alvarez when asked about a third fight by The Ring during the call. 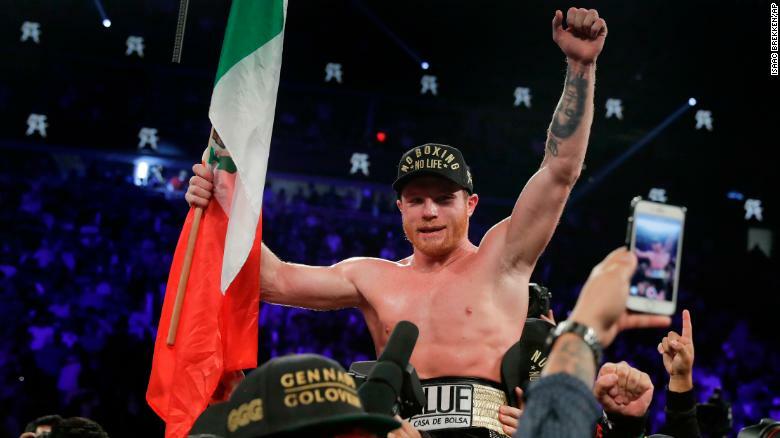 Alvarez recently signed a lucrative 11-fight deal with DAZN said to be worth $365 million across five years. If Golovkin wants the third fight to happen he will need to sign to the platform. The Kazakh bomber’s promoter Tom Loeffler said this week that a decision would be made soon on whether they sign with DAZN or streaming rival ESPN+. “Gennady will make a decision this year on the direction he wants to go in,” Loeffler said to Dan Rafael of ESPN. Meanwhile Alvarez is putting the finishing touches on his preparation for his bout against WBA ‘regular’ super middleweight titleholder Fielding – a fight that will take place eight-pounds north of his usual weight class. The fight is considered a tune-up before return to middleweight to defend his world titles. “God willing I win this world title and come back down to 160 pounds,” said Alvarez. “Winning by KO is always impressive and I’m planning to do my best to get it in this fight by any means necessary.